The United States government is well-known for generating red tape. Still, when the will of a dedicated pet lover intersects a dog in need, even governmental regulations can be managed. Military Working Dogs must be at their best at all times. A good veterinarian and a good trainer are needed to make that happen. Air Force Technical Sergeant Benjamin Collins is an 81st Security Forces Squadron Military Working Dog (MWD) trainer. Not long ago his unit needed a new detector dog because one of theirs was approaching retirement. Sgt. Collins was sent to a supervisor’s course at Lackland AFB in San Antonio, TX, where he met Bady, a German Shepherd who had “washed out” of detector training. Collins decided to take over Bady’s training himself. 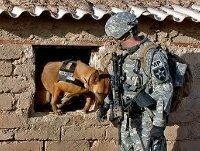 Otherwise the Air Force would have to expend funds to obtain another dog and Bady would have been limited to patrol duty, probably overseas. Instead, Sgt. Collins had Bady fully trained, qualified and certified in just two months. To accomplish this feat, Collins had to come in after a full day’s duties to train Bady at night.